The book begins with Mitch Johnson returning to his home, the small town of Morecambe where he tells his lifelong friend, Rupert Watts, that a young woman is going to be murdered. Mitch, who has psychic abilities, thinks that the killing will mirror that of a schoolgirl fifteen years earlier, a crime Mitch himself was suspected of committing.With no idea when the murder will take place, or who the victim is, the friends turn amateur detective and endeavour to find the girl before she comes to harm. But they must also contend with Don Hague, a senior councillor and central figure in the dark underbelly of the town who holds Mitch responsible for the ruin of his career and his reputation in the town. The police are watching Mitch, and they are also watching Don Hague.Who is the girl Mitch is convinced will die? How is her death linked to the schoolgirl murder? Is Don Hague, or his associates, involved? 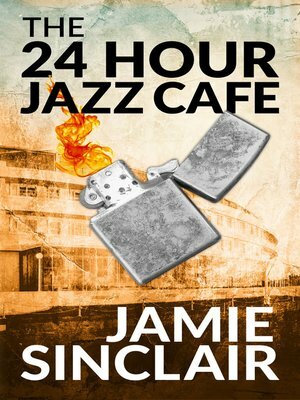 Can Mitch and Rupert convince the police to take them seriously before it's too late to save a girl's life?Praise for The 24 Hour Jazz Cafe: "This book turned out to be a thoroughly stonking read! It started off pretty gently and then the story, action and indeed characters gradually built up to a pretty great crescendo which, along with the grand finale, left me almost breathless.Like Mr Sinclair's other books, the careful use of description, along with great characterisation, meant that I could "see" the action very clearly - another one for the screen maybe?I hear a whisper that Mitch and Rupert may return. I for one hope so...""This book is a must have. It was so gripping I had a job to put it down. I have never read a book so fast! Superbly written with an excellent twist. A nice gentle start which built up to an exciting and gripping action packed story with a brilliant finale! I would never have guessed the culprit or that some would have walked away alive. Excellent characters and descriptions, some you could like and others you would not. You could almost visualise the characters on the page as you read. It has it all Crime, Corruption and Murder ~ Brilliant. I will be definitely purchasing more of Jamie Sinclair's books. Lets hope there is more Rupert and Mitch!"